The average American consumes about 3400 milligrams of sodium daily, most of it coming from processed foods. Now it turns out processed salt could be downright dangerous for your brain according to a new study. But are all salts created equal? And isn’t too little salt in your diet as equally dangerous? Here’s why you need to switch to Himalayan salt. So, it turns out, all that processed salt you’re consuming could be doing more harm than even raising your blood pressure. A new study published in Nature Neuroscience reveals that diet high in salt may actually cause cognitive impairments. The animal study showed that when mice were fed a very high-salt diet, their mental performance declined due to their brains not getting enough blood. With too much salt in their diet, the mice lost most of their maze-solving ability. Interestingly, this change in brain function occurred even without raising their blood pressure, which is normally linked to a high salt diet. Furthermore, the study showed that high doses of salt were causing an immune response in the small intestine of the mice. This resulted in an increase of an inflammatory substance in the brain. “The brain is a prime target of the harmful effects of salt,” suggests the study. Researchers fed the mice eight to 16 times their normal salt intake. 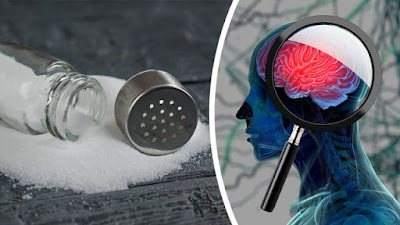 An amount, say the researchers, that is “comparable to the high end of the spectrum of human salt consumption.” The results showed a reduction of blood flow in both the cortex and hippocampus. Both areas in the brain regions that are associated with memory and learning. “After about three months, the mice became demented,” said Dr. Costantino Ladecola of Weill Cornell Medicine in New York. And it could be the same for humans. But, the decline might not be as aggressive for humans. The mice were fed extremely high levels of salt. That said, “probably over years and perhaps decades — as opposed to a few months for the mouse — even lower levels of salt may have a devastating effect,” on humans, said Dr. Iadecola. This research shows, once again, how gut and brain health are connected. More importantly, the dangers associated with a diet high in processed salts. But what about other salts like Himalayan or sea salt? All salt is the same… right? All salt is actually similar and contains two essential elements for life — sodium and chlorine. But varying salts have different levels of nutrition and minerals. In fact, distinguishing between salts really comes from how and where the salt is processed. There are two main ways, in which salt is harvested: either from salt mines or by evaporating sea water (or other mineral-rich water). Common varieties include plain table salt, Himalayan pink salt and sea salt. So, which type is healthiest? Is Himalayan pink salt really better for you than the average table salt? Himalayan salt, like sea salt, is minimally processed. It’s an ancient sea salt that has alchemized over millions of years into a special energized crystalline form in a process similar to how coal gradually becomes a diamond. The minerals make Himalayan salt more easily absorbable and much more usable by the body compared to other salts. Table salt, on the other hand, is typically mined from underground salt deposits. It’s more heavily processed to eliminate minerals and usually contains an additive to prevent clumping, according to the Mayo Clinic. Most table salts also have added iodine, which is essential for maintaining a healthy thyroid. High-quality sea salts naturally contain 60 trace minerals. However, when it comes to Himalayan sea salt, it contains 84 — making Himalayan salt a great source for minerals. This is particularly important since it’s becoming harder and harder to obtain trace minerals from the highly processed foods we eat and even the soil our food is grown in. Should your diet be salt-free? Here’s the thing, 75 percent of the salt in the American diet comes from processed foods. Only 25 percent actually comes from natural, whole foods, or is added during cooking, or even at the table according to research. So, it’s easy to overwhelm our bodies with processed salt simply by eating refined foods at every meal. The result is hypertension and cognitive impairment. The key to healthy salt intakes really comes from moderation. The 2015-2020 Dietary Guidelines for Americans recommends eating eat less than 2,300 milligrams of sodium daily. This equals about one teaspoon of regular table salt. But to retain the most benefits of salt, choose Himalayan salts or other minimally processed salts that don’t contain additives. Himalayan salt, by the way, does contain some iodine, although only in trace amounts. So, for anyone who is iodine deficient or at risk of deficiency, you may need to look for other sources of iodine. Here’s the bottom line… yes, your body needs salt. No, you shouldn’t be getting it from highly processed foods and highly processed salt. Now pass the Himalayan salt, please.